On the 30th of October 2018, The Restaurant Group plc announced its plan to purchase the entirety of the issued share capital of Mabel Topco Limited, the holding company of Wagamama, effectively acquiring Wagamama, a high-growth brand in the casual-dining industry, for a cash payment of £357m, which implies an enterprise value of £559m. Wagamama will then become an autonomous division of the combined group, in an attempt to retain the restaurant chain’s leading market position in pan-Asian cuisine and distinct brand value. In 2017, the group posted £679.3m of total revenue, roughly £30m down from the previous year. Wagamama, a British restaurant chain focusing on Asian food based on Japanese cuisine, opened its doors in 1992 in London where it is still headquartered today. In April 2011, Wagamama was purchased by Duke Street Capital, a private equity firm, for an estimated £215m. As of November 2018, the chain operates over 190 restaurants with 130 restaurants based in the United Kingdom and has further presence in over 25 more countries. In 2018, total revenues for Wagamama increased from £266m in 2017 to £307m, this during a turbulent time in the UK restaurant market. As the minimum wage in the UK has been raising during the past few years, labor costs and prices have increased. The competition is fierce due to the vast number of participants and the necessity to foster customers’ loyalty in the food delivery business. The expansion of casual dining chains in recent years has meant for customers the power to choose among multiple options. And hence, as Deloitte concluded in a report published in September of last year, the common success of firms could have induced the industry to an oversupply. The industry faces an additional burden which is the falling consumer purchasing power. Indeed, on the one hand the weaker pound, since Brexit, has risen the costs of importing food; on the other hand, a longer-term decline in real wages means customers are worse off and consumer spending has fallen as a result. Indeed, the Office for National Statistics (ONS) has reported that albeit employment is increasing at an impressive rate, real wages are falling at an unprecedented rate and the average total real weekly pay has fallen to 2005 levels. In addition to the above, business rates have risen, as have rents. All these preoccupying factors are generating serious concerns among investors. For instance, the share price of The Restaurant Group has fallen more than 60 percent since the beginning of 2015 whereas private equity firm Fulham Shore, owner of competitors Franco Manca and Real Greek, has suffered a 50 percent decrease since the end of 2014. There are, however, outliers such as Wagamama. Nowadays, the company has 196 directly-operated and franchised restaurants and its newest figures showed that sales growth rose by a remarkable 9.6% and recorded a £34m increase in revenues compared to last year’s figures. On October 30th, TRG announced that it had reached a conditional agreement to purchase the entire issued share capital of Mabel Topco Limited, the holding company owner of Wagamama, for £357m, implying an enterprise value of £559m. The Acquisition will be funded through a combination of cash, new debt and a rights issue. As specified in the October 30th The Restaurant Group’s announcement for shareholders, the operation is going to be financed through the withdraw of £220m of a revolving credit facility that has been underwritten for TRG by the RBC as arranger and original. The cash payment consists of £207m regarding the consideration for the entire issued share capital of Wagamama, and £150m concerning the repayment of shareholder loans. Finally, The Restaurant Group will assume a net debt of £225m at Wagamama and a rights issue, that has already been underwritten on a stand-by basis by J.P. Morgan securities, will be undertaken to raise £315m. Over the last years, the eating-out sector has suffered with the declining consumer spending and the rising business rates following the Brexit decision. In particular, The Restaurant Group’s total revenue dropped from £710.7m in 2016 to £679.3m in 2017 and operating cash flow decreased from £98.0m to £80.3m in the same time period. Conversely, Wagamama has been consistently overperforming the market and has gained appreciation of the public for its food. The company’s revenue climbed from roughly £266m in 2016/2017 to £307m in 2017/2018 and gross profit went from £115m to £129m in the same period. Therefore, the deal allows The Restaurant Group to leverage the image of a widely appreciated brand and to diversify its offerings within the United Kingdom. Wagamama’s products effectively address various customer trends such as the increased desire to consume healthy food and to receive fast delivery. In addition to that, analysts anticipate that The Restaurant Group will be able to generate cost synergies of approximately £15m and site conversion synergies of roughly £7m as well as improve earnings per share in the first year. Including these figures, the purchase price multiple would fall to 8.7x EBITDA. Finally, the acquisition allows The Restaurant Group to distance itself from Frankie and Benny, the Italian restaurant chain which has recently produced low profits, and to focus more on other fast-growing channels. Despite the strategic and operational benefits, the acquisition value of approximately 13x EBITA is unusual for a transaction of this sort. Average restaurant valuations normally lie in the range of 8 – 12x EBITA. For example, Darden Restaurants’ acquisition of Cheddar’s Scratch Kitchen was priced at 10.4x trailing twelve month adjusted EBITDA ($780m). In addition to that, Shareholders have already voiced their concerns with the deterioration of the capital structure of the firm in a time in which the industry is declining. The ability to maintain Wagamama’s results is also put to question, since the owners had refused a previous bid with implied enterprise value of £600m saying it was too low. The acceptance of an even lower value might indicate that the confidence in the company’s growth is not so strong anymore. The deal news was not welcomed by investors and The Restaurant Group’s stock price fell as much as 18% on the 30th of October. The market believes that the company is overpaying for the acquisition of Wagamama and that the transaction will actually be dilutive for existing shareholders. 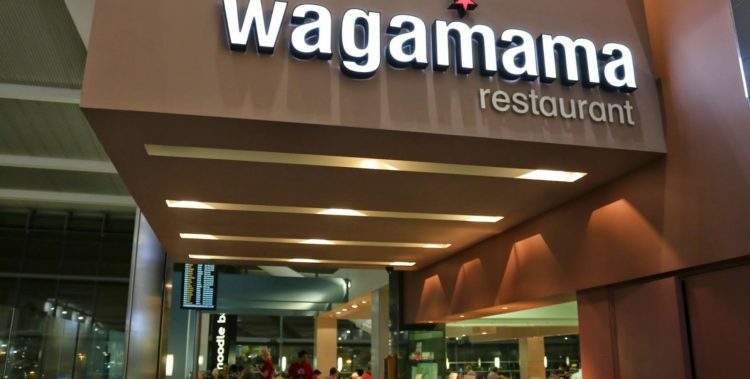 Several individuals have likewise expressed concern that the private equity ownership has drained Wagamama’s cash reserves and reduced the firm’s capital structure flexibility. The price of Wagamama bonds, which reach their maturity in 2022, rose after the announcement. Royal Bank of Canada acted as the lead financial adviser and underwrote the revolving credit facility. The rights issue was exclusively underwritten by JP Morgan, although Numis may also participate in the transaction.